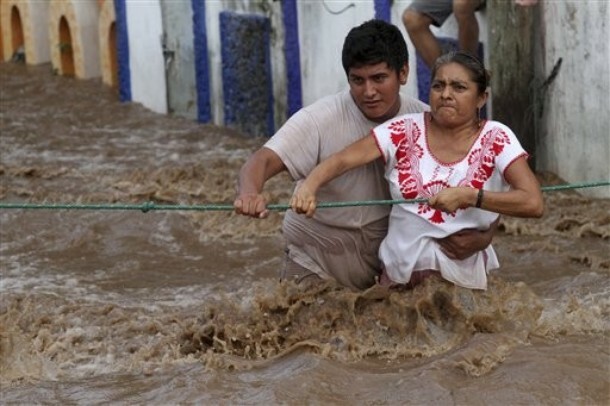 Please help flood victims in Oaxaca!! Please? I have spent a lot of my life following natural disasters--AND despite the fact that my own life is its own natural disaster that needs saving, I always find myself heading off with backpacks full of stuff and money to assist those in need! I have this random altruistic vision that I am actually helping out humanity on some level, even if it is small. But sometimes, it seems...so defeating and exhausting. I never know if I should stop the insanity or continue with it!! Your guess is as good as mine...for now i will continue to follow my insanity, it's seems more natural. 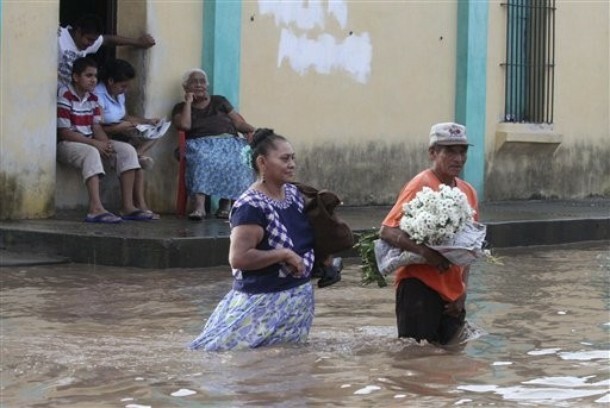 As some of you may or may not know, We are currently living in Oaxaca...it's severly flooding out here. We are totally safe!! We live in a gorgeous 350 year old hacienda on one of the highest points of the historic district. We can go a mile or two down and everything changes. I am in Oaxaca to create, grant write and mostly REST, which I do very little of nowadays...but there is a huge nagging that is coming my way...and it's really eating away at me, so I need to deal with this urge to help, at least a little. A little is good....right? Right now I am fatigued. We tried saving a 5 week old kitten that just passed away on us at 2 o'clock in the morning and needless to say...it's been a tough day. So to be setting up donation buttons and blogging is not exactly what I want to be doing. BUT my conscious is not letting me sleep, so I decided I need to listen to it and do something! (Two hours of my life is NOTHING....these two hours might make a difference to a Oaxacan family in need. I don't know why my brain is wired like this?? I think it's because of my first experience with disaster that hit close to home as a youth. I don't remember how old I was, probably in the 8th grade, maybe, but a Tornado struck Saragosa, a small town near my hometown (Pecos, Texas) nearly wiping it completely out. I have a really bad memory, but I remember the tornado hitting a school during a kindergarten graduation--Enough said huh? Pretty devestating stuff! 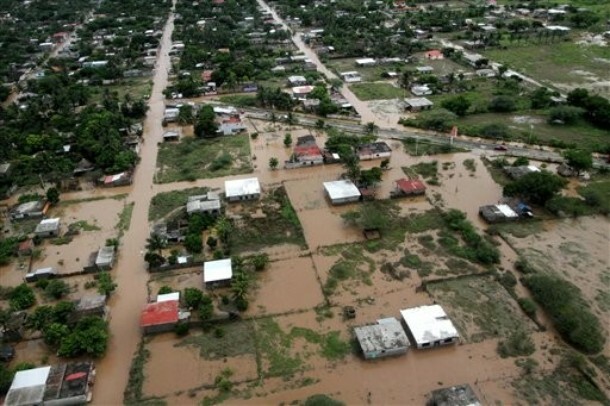 One of my teachers was in this horrid natural disaster--SIGH! I remember volunteering long hours of sorting, packing and helping to get medical supplies organized to get to the victims. I remember everyone walking around shocked and going thru with the motions of helping family members and friends who were victims of this terrible tragedy. I remember funeral services en masse and I remember wishing that it would all GO AWAY. This experience haunts me and will forever continue to haunt me...memories like that don't go away, they just linger. Since then I have done relief work all over the world and have helped out more non-profits than you could ever imagine. Somewhere in the middle I even found time to co-found http://www.artforhaitianchildren.org/ and dedicated many of my years on the war/disaster torn nation of Haiti. Although Haiti is an important chapter in my life, I walk farther away from it with every day that I live. It's an emotionally and financially draining country. BUT the foundation is still going strong thanks to our President Judy Hoffman who has taken the foundation to another level. Many of my friends are a part of the program and it is a village of amazing people pushing it forward. Anyway.......Where was I going with all of this? Oh yeah...I am sitting here in Oaxaca feeling guilty about not helping. My Uncle, who is more like a father to me, is always on me to help out my own country (I'm Mexican). Everytime I come home from some humanitarian mission he scolds me about the need to help in my own backyard. I take my scoldings and usually nod my head in shame. My uncle is currently behind me (emotionally, not physically) scolding me for doing NADA...ZIP...NOTHING!! It doesn't get closer to my own backyard than 2 miles away! AND..... guess what! I'M NOT HELPING!!! IRONIC HUH? A NATURAL DISASTER 2 MILES FROM ME...and I'm ignoring it! Why am I ignoring it!??? I'm tired....I need a break....I don't want to see pain....I don't want to feel the suffering. I want to hide in my beautiful hacienda filled with exotic plants and gorgeous mosaic tile and shut out the world! That's why! But...I can't. So here goes...I need your help...and I need it DESPERATELY! Here is my plan...since i TRUST NOONE (years of experience talking) I plan on raising money via my paypal account and taking the money DIRECTLY to the area that has been hit the worst (not quite sure where that is ...I've been ignoring the news....Sadly) BUT....Depending on what is needed...either we buy it here and bus it in...or we give out cold hard Pesos...whichever seems better! Believe it or not...sometimes money doesn't function when there isn't anything to buy....interesting isn't it? Currently I have some deadlines I am dealing with...so I can't do anything until the 26th of September...which gives me plenty of time to beg for money! By then...I hope that things will settle and we can safely head out to the villages with an altruistic spirit in tow and my guilty conscious put to rest! And who knows...it might be our own family that needs help! We can't reach the village. Roads have been washed out...communication is out...the crops are flooded and in danger....SIGH...so now you know why I want to tune this whole thing out? Thanks so much for reading me out....I really appreciate you time...please help out by pushing the Paypal button...it's safe...it's secure, I have a 100% verified standing. Gracias!! A tired and weary globe trotting humanitarian...that needs a long long nap!